What It Means When Someone Says "Hiiiii" Instead Of "Hi"
Let's be real: We all text, IM, and, occasionally (occasionally) utter, "BRB." Some of us do so more than others, but it's safe to say we will all send out a text today with improper grammar and some clever abbrevs. The weekend-ready, "Hayyy! Let's go ooout tonight! 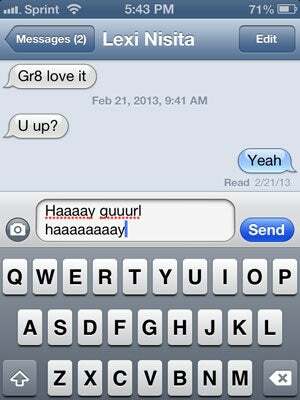 (insert a quirky emojii of two dancing girls)" is a lot more inviting than receiving a text that reads, "Hello! What's everyone looking to do tonight? Shall we hit the town?" Yet, you aren't just giving your thumbs a rest — you are letting your text literally "speak" in your voice. Sali Tagliamonte, a linguist at the University of Toronto, has analyzed over four-million words over the past five years and found patterns in the "word-lengthening" movement that bring logic to button-based vernacular. By adding extra a's, y's, i's, and e's, electronic words become more human. Common colloquialisms like um, like, and so don't detract from a text like they may in spoken language; rather, they work to intensify a phrase. For instance: "The date wasn't that great. I was just, like, 'Check please!' and left." The loosening standards of the written language are making it okay to say, "k." Using abbreviations and adding vowels are a means of carving out our individuality in a medium that virtually (pun intended) flattens our writing style. "When people talk, they use intonation in a number of varied and subtle ways," says author and linguist Michael Erard. “There’s a lot of emotional nuance that can be conveyed that you can’t do in writing.” True, it can be argued that handwriting adds personality to text, but the days when we can handwrite a text seem far off (and a little silly considering the comparative speed of typing).